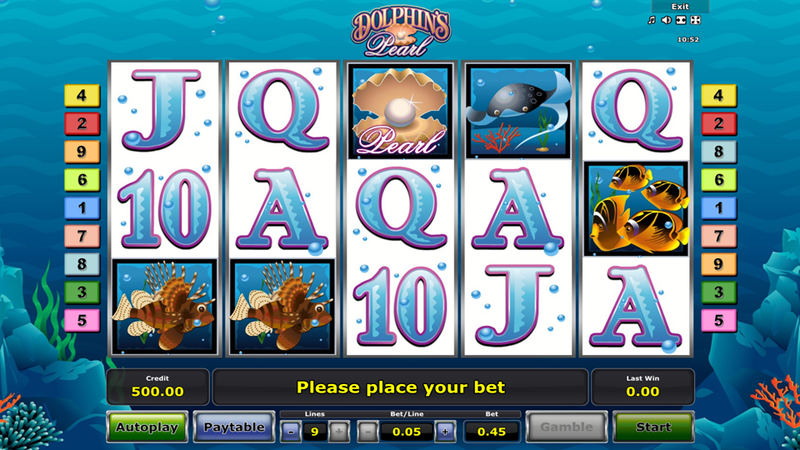 Dolphin’s Pearl is a classic Novomatic game built on the paytable with 5 reels, 3 rows and 9 adjustable paying lines designed a slot machine from landline casinos that offers a chance to score a big win with the Wilds, Scatters, Free Spins and multiplied winnings. The Dolphin’s Pearl slot review comes with a pack of helpful tips you’ll surely want to implement in order to boost your bankroll, so please keep on reading. Unfortunatly, we have no free play mode for Dolphin's Pearl available. Check out the screenshots below and hop right into action with one of the recommended casino sites! Combine 3 or more sea-themed icons working as those with the highest rating on the paytable or get the same number of playing cards placed from the leftmost in order to form a winning combination. You can place 1 to 45000 coins per round to score anything between 4 and 9000 coins. The Shell with pearl work both as the scatter and a medium-paying icon that triggers the free spins round and pays 500 coins for 5 collected. Get 3-5 scatters to activate the free spins bonus round and receive 15 extra spins where all your winnings will be multiplied 3x. You can also activate the Gamble feature and improve the balance when guess correctly will the Tails or Heads appear the first. The game works flawlessly on both iPhone and Android devices without a need to download a special app. Demo mode is enabled by default, and you can easily switch from free play to cash gaming. 3. What is the RTP factor of Dolphin's Pearl? The Novomatic powered sites offer the RTP around 95.13%, so the winners must work a bit harder in order to land a big win. Classic gameplay and design that brings memories back combined with multipliers and free spins will never stop to grow the audience looking for a fast-paced action and reels that keep spinning instead of themed and adventure-based game. If you’re a part of this community, try your luck and be rewarded as you play.